The Cliff Base trail is located in the Boca Negra Unit of the Petroglyph National Monument near Albuquerque, New Mexico. The trail travels along the foot of a mesa where many of the basalt boulders have petroglyphs pecked upon them. Some of the petroglyphs date back at least 3000 years although 90% of them are of the Rio Grande style that date to between A.D. 1300 to the 1600s. To get to the trailhead first find your way to the Visitor Center where the ranger can provide the latest information along with a free brochure and instructions for getting to the Boca Negra Unit from there. Upon arrival to Boca Negra you will need to purchase a parking permit which is $1/vehicle on weekdays and $2/vehicle on weekends. From the ticket booth continue driving around the loop. 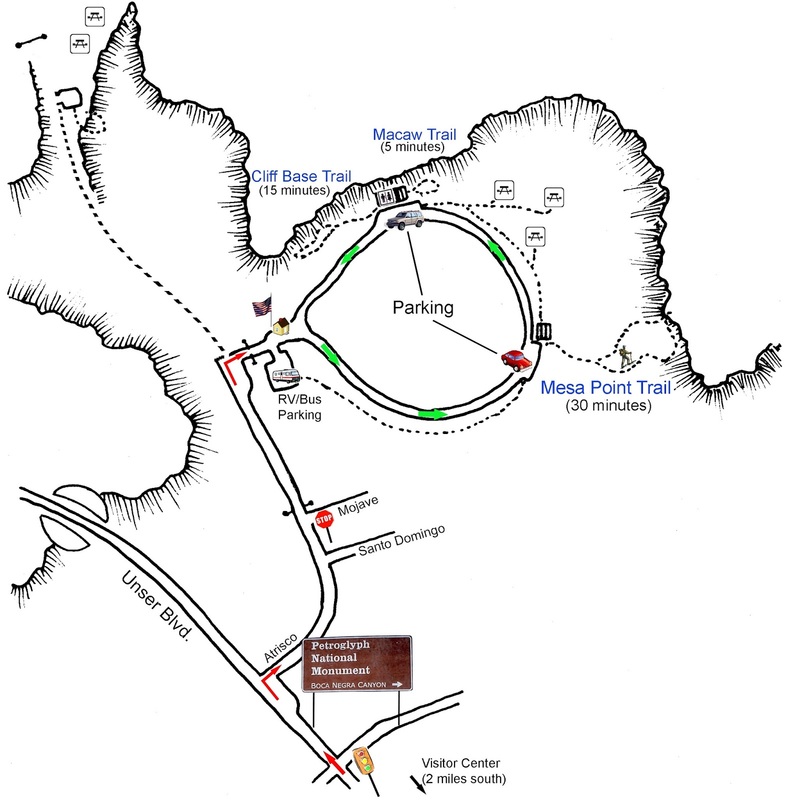 The Mesa Point trailhead will be the first that you come to. 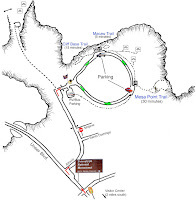 The next parking area is where the restroom is and the beginning of the Cliff Base and Macaw trails. The path that the Cliff Base trail takes is overlaid with pavement. In places there are rocks that protrude from the asphalt making it mostly unsuitable for strollers or wheelchairs. It also makes use of concrete steps that lead up through the boulders to get closer to some of the petroglyphs. Several images like spirals and these concentric circles are universal in southwestern rock art. Others are uniquely Rio Grande style. Without intervention there will be some images that will soon be lost forever. The surface of this boulder is onion skinning away. Part of the top layer has already fallen off. Close examination reveals cracks that indicate the process will continue as water seeps into the cracks and freezes causing them to expand until the surface layer eventually separates and falls away. A few of these images look like they came right out of a comic book. For best picture taking it would be better at a time of day when the light is more diffused and not shining directly on the boulders creating a glare. 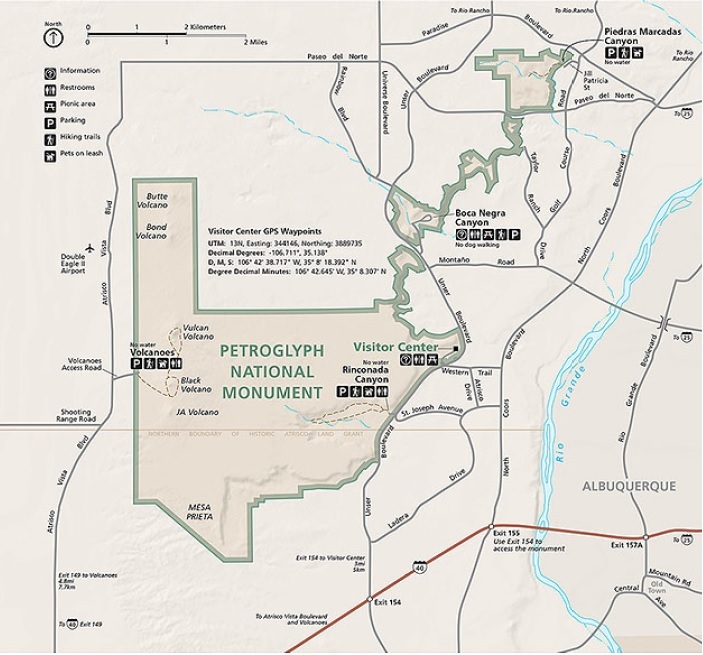 The brochure mentions that the Boca Negra Unit of Petroglyph National Monument receives the most visitors. 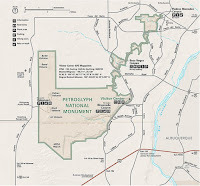 It is easy to get to and has a good sampling of petroglyphs spread out over a small area. All total the monument has over 25,000 petroglyphs. A stop at the Visitor Center and the Boca Negra Unit will only take a couple of hours out of your day. To see the other units, including the volcanoes, plan on 1 -2 days for a leisurely experience. If you would like to see it for yourself then all you have to do is 'Take a hike'.